His mother slaughtered by a pack of Ceratosaurs, a terrified Allosaur must make his way across the sweltering deserts of Jurassic North America -- or face the same fate himself. The Hunt is on in this new chapter of Ricardo Delgados Age of Reptiles! 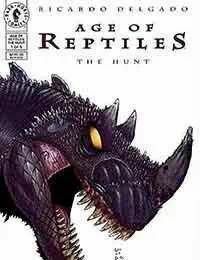 Told entirely in pictures, the Age of Reptiles series is regarded as one of the finest uses of the comics medium and is appropriate for all ages.